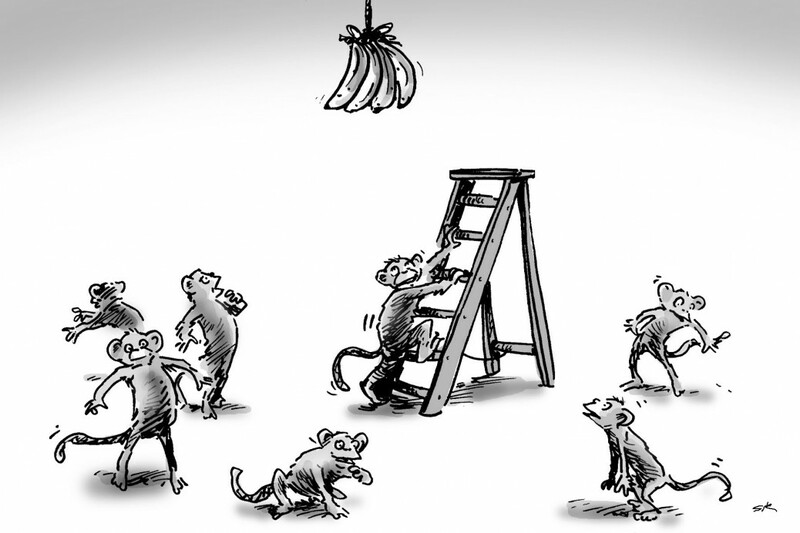 Don’t listen to those monkeys…Keep climbing! Ever step back and evaluate why you made a certain decision? Do you ever feel like there should be a better decision or more lucrative outcome to your decision? Take a second to dig into whether YOU truly made the decision or were you influenced by those in your organization or peer group? The validity of the experiment is irrelevant, but I think its lesson or moral is valid. Our organizational cultures are shaped by this very behavior. We mimic the behaviors of those we are surrounded with as to not stick out nor go against the grain, thereby in turn receiving negative judgement from our peers. Why can’t I climb the ladder? What will really happen if I do? I think organizations would benefit by having more monkeys ask this question and test some boundaries. Even if at one point there was a negative consequence to an action, our playing fields these days are evolving so fast and changing so rapidly, it may no longer derive the same outcome. If we aren’t willing or able to test the boundaries, our outcomes will remain predictable. Nothing changes, and we all remain satisfied with status quo. Go be a curious monkey. ← Hey you! Yes you! Stop overthinking it, just get it started!